At its inception in 1787, the new U.S. constitutional government began with the premise that people could successfully rule themselves. But could this form of government endure, or would it fail, as did the democratic Greek city-states and the Roman Republic? Will our departure from the principles upon which we were founded be the death of our civilization? In light of the serious nature of these questions, Zeezok Publishing produced A Noble Experiment high school government course. We want succeeding generations to successfully prove the hypothesis of self- government. Download a sample of this book (PDF). Built around primary source documents and the classic film Mr. Smith Goes to Washington, A Noble Experiment’s conservative approach to the study of government combines video instruction with a consumable student workbook and a CD of teacher materials used in the one-semester course. The student workbook contains a course outline, a course syllabus listing the daily assignments and materials needed for each day’s lesson, the primary source readings, various student activities based on the readings and the DVD lessons, and periodic assessments (quizzes, tests, and a two-part final exam). The teacher CD includes the course outline and course syllabus, a grade book to record student scores, answer keys for all graded assignments, and a transcript of each video lesson with highlighted key concepts. The transcript enables the teacher to quickly look up pertinent information without the need to watch the video lessons. Students may also use the transcript to review for assessments. Designed to be student-directed with a minimum of teacher preparation and involvement, this course can be used by an individual student or in a home school co-op setting. The forty-eight lessons can be modified to accommodate a co-op schedule or unique individual circumstances. On non-class days, students read the primary source documents, complete “homework” assignments, or study for assessments. 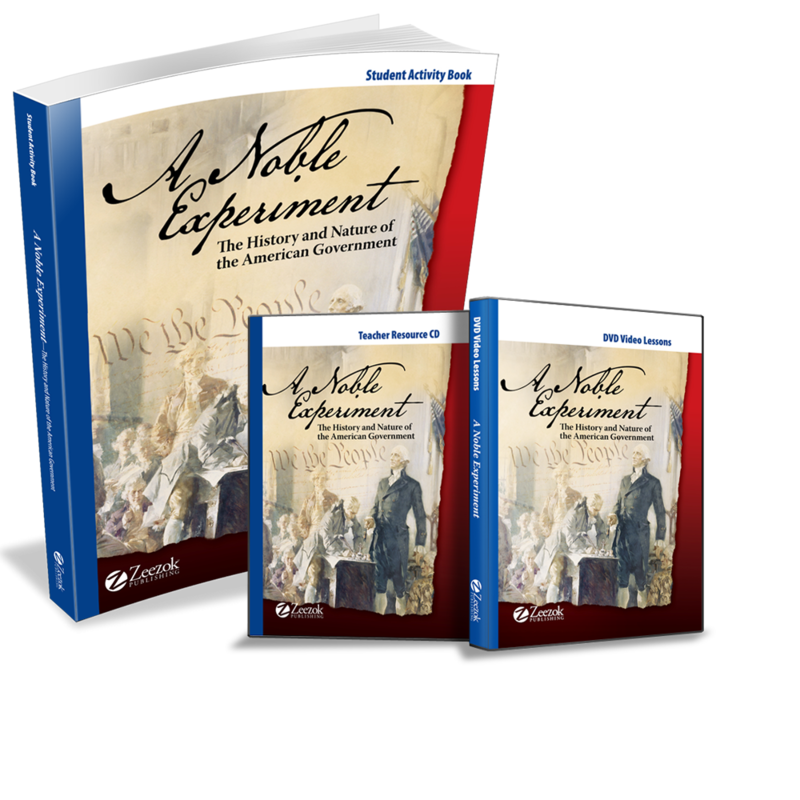 A Noble Experiment covers all the national standards for high school civics and government, as well as the subject matter traditionally included in secondary government courses. With its unique and interesting approach to the subject matter, we trust students will enjoy studying the foundations, principles, and organization of our government. Students will explore the political heritage which impacted our nation, study the Declaration of Independence and the Constitution, and discuss contemporary issues affecting our nation such as immigration and globalization. You can view a sample of a video lesson below. Q: What all does this set include? Does it include the DVD set, the teacher resource CD and the student activity book? A: Yes, it includes one Student Activity Book, the DVDs and the Teacher Resource CD. Q: If we purchase this for our homeschool co op, can we put the videos each week on a site we all access for homework so the students can watch them prior to class? They would each purchase their own workbook. A: I'm sorry but that would not be an acceptable use of the videos and would infringe on the copyright. The videos are intended for home use, however, we do give permission for co-ops to view them together as a group in a classroom. Q: How long is each video segment? If this program is used all year, how many video segments would students watch per week? A: Please preview the sample pages of the book include in the description of the program. They are available as a pdf. It includes a list of all the videos and their length. The program is intended to be completed over the course of one semester. If you choose to do it over a year then you would need to decide to to rework the weekly lesson plans.